We’re having a heat wave here in San Francisco, and what better way to cool off than with a refreshing pitcher of sangria? As it turns out, pink moscato makes an excellent base for this fruity concoction–just add some strawberries, hibiscus, and a little sparkling water, and voila! 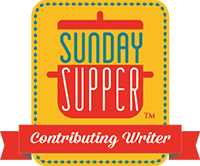 In the past, I’ve leaned towards a more traditional sangria, but recently during our #SundaySupper chat celebrating #MoscatoDay, we bantered around some moscato ideas, and this one stuck in my head. As you may recall, I made Mango Moscato Sorbet for that event using the white moscato. However, Gallo Family Vineyards had generously provided me with a bottle each of red and pink moscato too. What to do, what to do. I knew sangria would be happening; it was just a matter of when. Then the heatwave struck. Despite living near the beach, we were hitting temps in the 90s. That’s way too hot for this Bay Area girl! So, the sangria was on. Using a combination of both frozen and fresh strawberries, I was really able to amp up the strawberry flavor (plus using frozen fruit is a great trick for chilling sangria). Since moscato is sweet on its own, I used an unsweetened sparkling water to mix in, with a small splash of the hibiscus syrup to balance it out. The end result was crisp and refreshing, and the strawberry flavor truly shines. The garnish–a strawberry stuffed hibiscus flower–was sublime. Go ahead, make yourself a batch while I finish up here. Get all your ingredients together, and make sure everything is well chilled. Start by letting the strawberries and the sliced lime steep in the wine for an hour or so. Then add the chilled sparkling water, the hibiscus syrup, garnish, and it’s ready to serve. I spent an inordinate amount of energy trying to get a great picture of the flower at the bottom of the glass. Eventually I gave up and ate it. 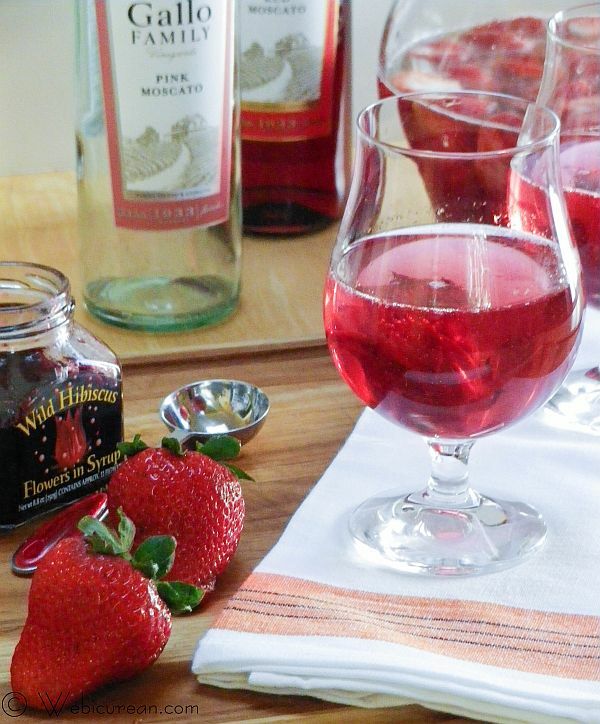 Strawberries and hibiscus flowers are steeped in pink moscato, then finished with sparkling water, to make a crisp and refreshing summertime sangria. Place the frozen strawberries, half the fresh strawberries (be sure to wash them first), and the sliced lime in the pitcher. Pour in the wine and stir. Allow this to sit in the refrigerator for a couple of hours so the fruit juices blend with the wine. 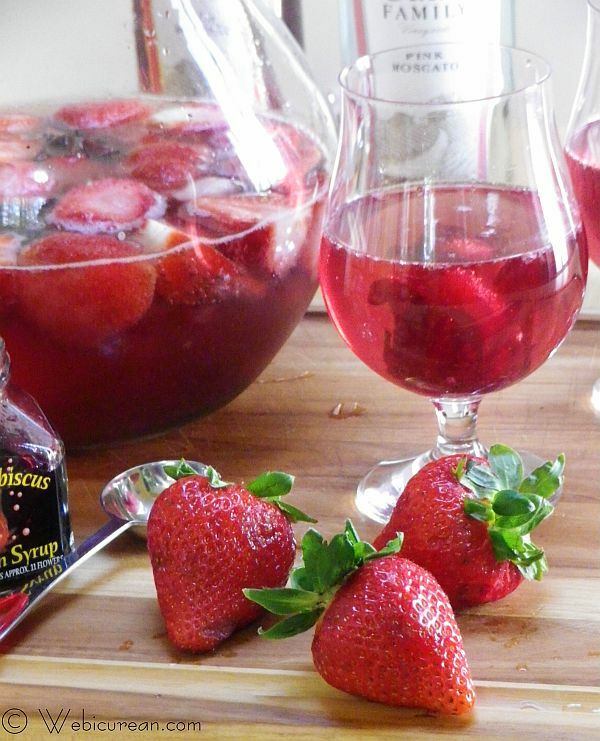 Stir in the sparkling water and one to two tablespoons of the syrup from the hibiscus jar or to taste. Cut the remaining strawberries in half, then stuff one half into each hibiscus flower. 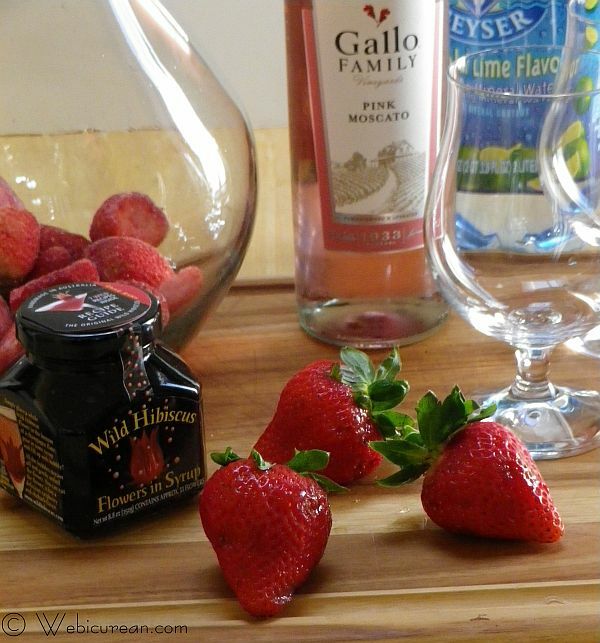 Use a strawberry stuffed flower as garnish in each glass of sangria. By the way, I wanted to give a shout out to my friends over at Red Envelope as this post was also inspired by the #redBar: summertime cocktailÂ project forÂ Red Envelope. Theyâ€™re sharing some fun summertime drinks as the weather gets nicer. Check out @redenvelope and #redBar on twitter for other great summertime cocktail ideas! This sangria sounds really good! Thanks! It was quite delicious!